Thousands of children are diagnosed with autism each year, with a rate of occurrence of 1 in 150 births, compared to 5 per 10,000 just two decades ago. This astounding escalation has professionals scrambling to explain why the devastating neurological disorder, which profoundly affects a person’s language and social development, is on the rise. Are we simply getting better at diagnosing autism, or is a modern health crisis unfolding before us? Of course, behind the numbers, the debate, and the speculation, individual families are struggling to live with autism every day. Some parents have described autism’s onset as being like a cloud slowly descending over their child, until the family is finally smothered by despair. Parents wake up each morning challenged yet again to reconcile the Spartan social world of their son or daughter with their own. After months and even years, most families are able to find a new kind of normal. Others never do. 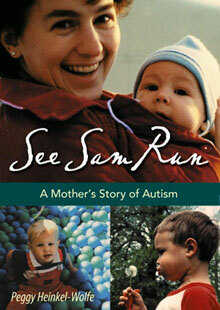 In See Sam Run, award-winning writer and journalist Peggy Heinkel-Wolfe describes how her parenthood quickly descended into chaos as her son, Sam, became uncommunicative and unmanageable. “I’d grown to hate making entries in his baby book,” she writes. “The energy I had before he was born, when I wrote paragraphs anticipating his arrival, was gone now. Writing down Sam’s barest achievements felt fraudulent.” Little by little, she found a new truth: that by learning to understand the ugliness inside herself, she learned to love her new life and her son, and to harness, at last, the energy needed to realize Sam’s fullest potential. See Sam Run reaches deep into the heart of anyone whose life has been touched by developmental disability–and it will resonate profoundly with those who have been transformed by a newfound ability to love.